In preparation for his Broadway opening of Peter and the Starcatcher, Orville decided to catch a wicked cold. It was so bad we alternated sleeping on the couch so we could both get better rest and maybe–just maybe–I could avoid being infected! So far so good, but his pre-Christmas cold took 3-4 days to manifest in me – on an 8 hour bus trip to Pittsburgh, so that was fun. Still hoping to avoid it this time around because I want to enjoy celebrating his Broadway milestone at their opening night party! This is me. You can't hear me, right? Really the best tasting coffee ever! Aaand… I acquired a new french press (steel instead of glass–here’s hoping I can’t break this one) and a lovely new sauté pan, gifts from a lovely friend. You know how I feel about pretty shiny new kitchen things, and these are indeed lovely and shiny. Our last french press bit the dust months ago, and we’ve been making do with a Melita cone and a tiny Mr. Coffee. They both do a respectable job, but I didn’t realize how much better I like coffee from a press until the new stainless steel Bodum arrived. 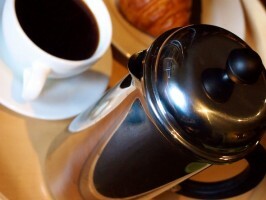 It just makes a richer, bolder, yet smoother cup o’ joe. OK – on to the recipes! 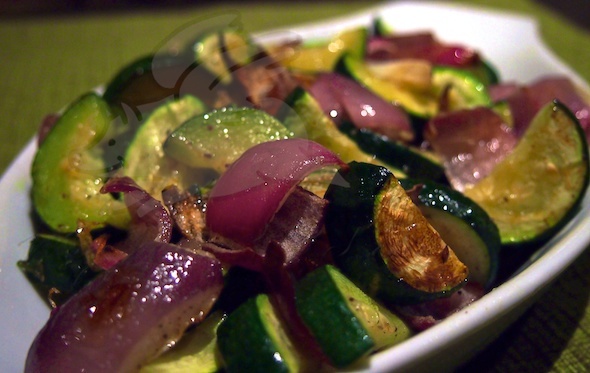 There are THREE side dish recipes below: Rosemary- Garlic Baked Potato, Rosemary & Garlic Roasted Home Fries and Sautéed Zucchini & Red Onion. All are super-simple and classic go-to dishes that pair with almost any main dish, so I hope you’ll use them often. Bonus, we’ll be using the last two in our upcoming Leftover Treat – a Veggie Frittata! I’m getting a little assist this week from my lovely cousin, Barb Ianni, who has dubbed herself Barb’s Test Kitchen. After she made and bottled my Rosemary Garlic Olive Oil, she looked at the leftover rosemary and garlic in the pot and thought, “What a waste.” So she whipped up a brilliant idea that uses those leftover herbs and the dregs of oil left clinging to them–she slipped them into a baked potato and let them work their magic on those spuds. You can see from the picture that this turned out pretty darned tasty, and it makes me think that seasoning a baked potato with Rosemary Garlic Olive Oil even without the leftover herbs is well worth investigating! Straight from Barb's Test Kitchen! Wash and dry the potatoes. Pierce several times with a fork or paring knife. Place in a microwave safe baking dish and microwave for 5 minutes (rotating halfway through if your microwave doesn’t have a carousel). Mince the leftover garlic cloves. Remove the potatoes from the microwave. Handling carefully (use a kitchen towel), slice the tops longways (like a hot dog bun). 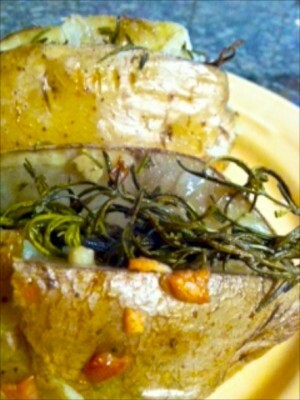 Insert a sprig of the leftover rosemary and stuff in half the chopped garlic in each potato. Brush the skins with Rosemary Garlic Olive Oil and season with Kosher salt. Finish the potatoes in the oven, baking for about 20-25 minutes, until a paring knife slides easily in and out. Serve along with more Rosemary Garlic Olive Oil, sea salt and freshly ground black pepper! 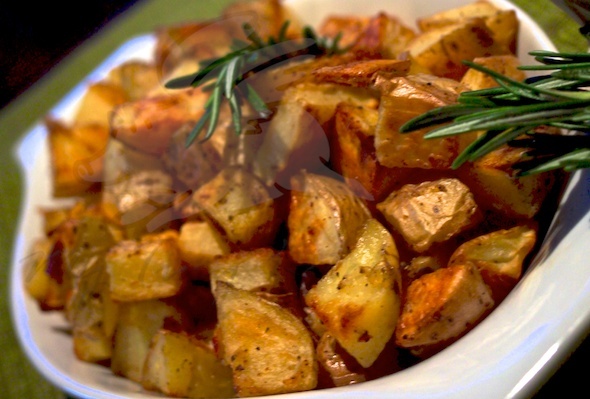 My next dish is take on roasted potatoes using Rosemary Garlic Olive Oil–simple, crunchy and delicious, perfect alongside steak at dinner or eggs at brunch. Be sure to make extra, because you’ll need about 2 cups for our Leftover Treat. Cut the potatoes into ½ inch dice. Transfer to a baking sheet. Drizzle the Rosemary Garlic Olive Oil over the potatoes and toss to coat. Season LIBERALLY with coarse salt and freshly ground black pepper. Roast for 15 minutes. Remove and use a spatula to turn the potatoes. Return to the oven for another 10 minutes. Turn the potatoes once more and return to the oven for a final 5 minutes of roasting. Remove and serve with leg of lamb, eggs benedict or just about anything. And don’t forget to save a couple of cups for a frittata in the morning! And finally, you can use this versatile oil for a quick veggie sauté. I’m using zucchini because you can get it any time of year. I’m pairing it with my favorite, red onion, which cook up crunchy and sweet. Again, make a little extra, because we’re gonna need it in our Leftover post! Prepare the zucchini by lopping off the stem and the end bit, slicing it lengthwise, and slicing it to make ½ inch thick half-moons. Peel the onion and lop off the top and root ends. With one of the flat ends down, cut the onion in half, then cut each half across the grain into ½ inch slices. You want them to be about the same size as the squash pieces. In a large skillet or sauté pan, heat one tablespoon of Rosemary Garlic Olive Oil over medium heat until it starts to shimmer. Add the onions and zucchini. Season with kosher salt and freshly ground black pepper and toss or stir to coat. Let it cook for 1-2 minutes until the vegetables begin to caramelize, then toss or turn the vegetables and let cook another 1-2 minutes. Test for doneness (this is up to you, but I like a little toothsomeness in the squash and crunch in the onion). This is a very quick-cooking dish, and the vegetables will continue to cook after you move them to a serving dish, so don’t overcook them. If you do cook it a minute or two more, keep the vegetables moving by tossing or stirring every 20 seconds or so. Remove to a serving dish and serve alongside… well just about anything, right?